Home / Posts tagged "savings"
Do you want to see if upgrading your heating system in your buildings will yield the EPC rating you are after in order to meet your MEES compliance obligations? What about changing the lighting? Will this achieve the required rating without the expense? eDash is a simple way to interact with your property or property portfolio. You don't need to be a property professional or an energy expert to calculate achievable ratings and savings from building upgrades. 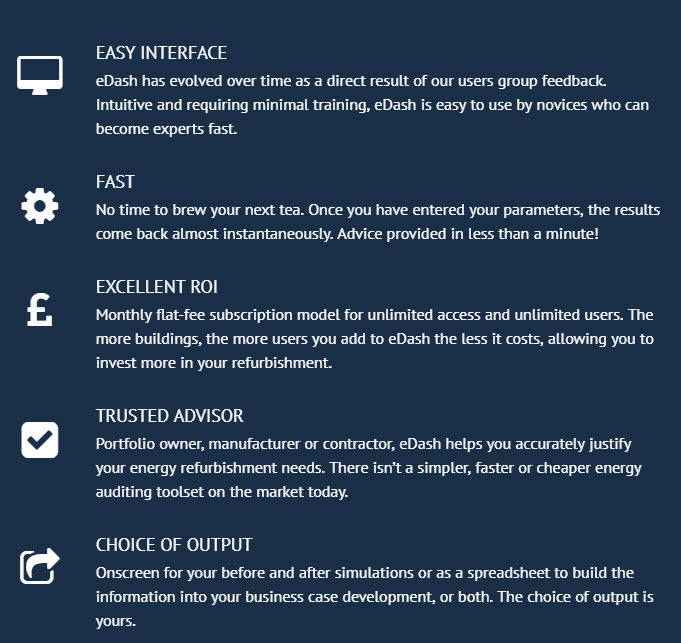 eDash removes the consultant, adds impartiality, saves you money and puts you in charge. Our easy to use cloud based software allows an unlimited number of projects to be managed under our subscription based service. Let eDash deliver the results and become your trusted advisor. The beauty of eDash is its simplicity. What you see is simple to use and easy to understand. Meanwhile in the background, algorithms leave no stone unturned in the pursuit of savings. Thousands of calculations are happening in real time to deliver you one thing - true and accurate advice. With no vested interest in the outcome, you can rest assured the advice you are being given is honest and without hidden agenda.